Do you suppose the kitchen counter guy will like it? hee! hee! Very pretty! I love the china pattern. Hope the remodel is going well with not too big a mess. Your centerpiece is beautiful! It goes perfectly with the rest of the dining room. I also love your new blog header - so festive! 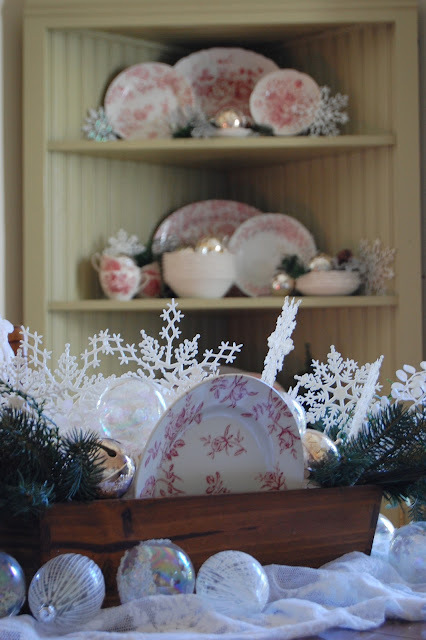 This is such a great time of the year to decorate! Have a great weekend! Wow! Is this pretty and I like the tie-in with the corner cabinet. The snowflakes are great...aren't you happy you have them, I haven't seen any this year. Your mother is a very wise woman and a gifted decorator, and you take right after her! I just got a new counter top and just love it. oh where did you find the snowflakes? very festive! I'm sure the counter guy won't appreciate your centerpiece as much as we do. Is the a rustic bucket or basket? I don't know about him Heather, but I LOVE IT!! I'm smitten! I love the mix of greenery with your dishes. Perfect! Can't believe you just "threw that together!" Looks very much thought out. Beautiful! I'm sure he will be impressed. 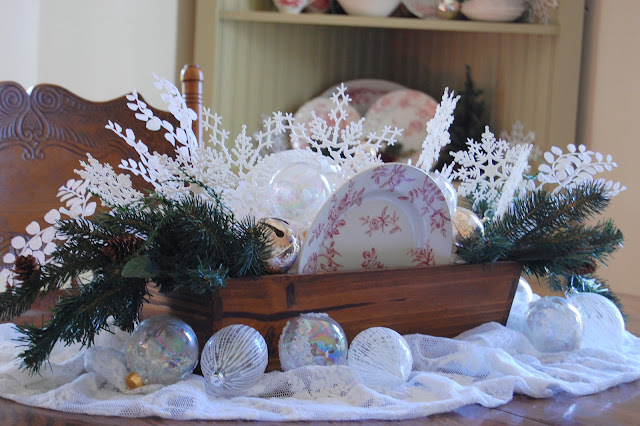 I really am liking your snowflake, sleigh bells, plate theme. Looks so pretty and airy. He better or he does not "get it".... I personally love it! That looks so pretty!!! I love it. Can't wait to see those new countertops. Oooh! It looks so lovely! What a beautiful job! That looks beautiful heather. I love your corner cabinet. It looks gorgeous. Love the way it all came together! Everything works so well and the red, white and greenery looks lovely! If that's what happens when you thow something together, can't imagine when you "really" put something together! Like the Christmas photos on your header! It looks amazing! I love the bells and the china. So pretty. Beautiful Heather!! Let me know if he makes a comment!! Come to enter the latest Giveaway from Design du Monde! It is a Framed Antique Architectural Print! Also Decor to Adore's Giveaway has some pieces you will love!! Well new countertops are certainly exciting...and the centerpiece is perfect. Happy Holidays! I like the mix of greens, snowflakes, and plates. Never would've thought to display the plates in the centerpiece like that but I really like it. It turned out beautiful. So much so that I know that even the counter guy will like and appreciate it too...Hee, hee, hee. Can't wait to see your kitchen all done...I'm soooo excited for you. I hope one day we can see a full tour of your beautiful home. There is probably so many beautiful art pieces that you have created that we still haven't seen yet.